Veteran coach Carlos Cueto just knew that coaching this year’s Union City High School girls’ basketball team might have been the biggest challenge of his long-standing career. Cueto, the former St. Anthony High and University of Richmond standout who was the head boys’ basketball coach at the now-defunct Union Hill for about a decade, then became the head boys’ coach at Secaucus for a brief stint, took over the Union City girls’ program three years ago and has made a smooth transition from coaching boys to coaching girls. But Cueto realized that coaching this year’s bunch of Soaring Eagles would be a tough task, considering the age of his entire roster, which features a host of freshmen. Cueto said that he hasn’t changed his coaching philosophy, going from boys to girls. The Soaring Eagles found themselves in a bit of a bind two weeks ago, when they had a 6-10 record and were watching their season slip away into oblivion. But the tide has turned recently, as the Soaring Eagles have now won three straight to get to 9-10 overall. The Lady Eagles defeated Memorial, 39-31, on Jan. 30 to get to within one game of .500. Cueto said that he tried to get the team more physically prepared for the rigors of Hudson County girls’ basketball. 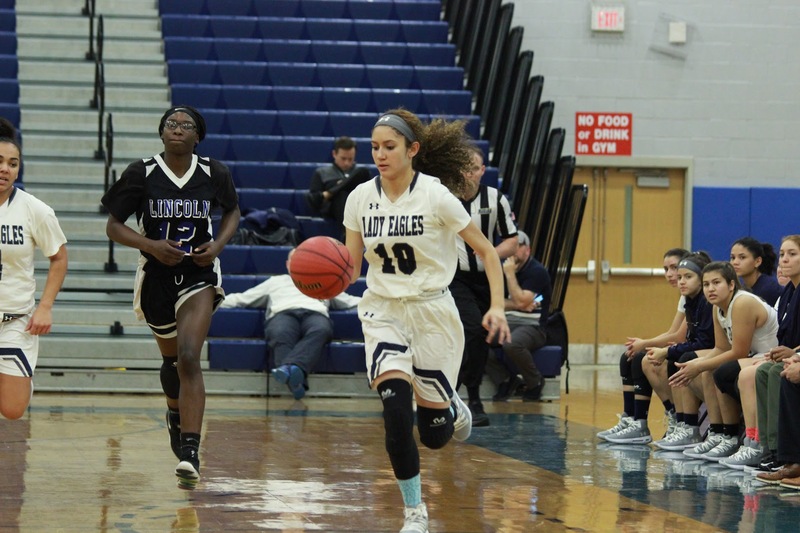 Cueto said that his team was handling the tough road of the Hudson County Interscholastic Athletic League, then the schedule makers weren’t kind, as the Lady Eagles faced league frontrunners Hudson Catholic, Lincoln and Bayonne almost in succession. “You go into those games and you just hope you can compete,” Cueto said. But the young Lady Eagles ran into three buzz saws those nights, falling to Bayonne (73-32), Hudson Catholic (66-18) and Lincoln (57-17). That’s enough of lopsided losses that could really demoralize a young squad. However, the Lady Eagles were extremely resilient and bounced back to defeat Kearny, Ferris, North Bergen and finally Memorial, the last three in a row. Cueto has put his trust in freshman point guard Elainy Pichardo. The 5-foot-2 Pichardo has been a work in progress, but her upside is tremendous. The starting shooting guard is another freshman in Erika Mercedez. The 5-foot-8 freshman is the team’s leading scorer, averaging 13 points per game. She’s had games of 25 against Memorial and 23 and 21 against North Bergen. It’s safe to say Mercedez likes facing the neighboring rivals from up north on Kennedy Boulevard. Stephanie Herrera is a 5-foot-5 do-everything. The senior is Cueto’s most reliable player. Zaynah Lopez is another freshman in the starting lineup. The 5-foot-10 Lopez is the team’s premier inside player and post presence. Junior Maria Lucia Gil is a 5-foot-8 forward who is still getting acclimated to her new home in Union City after arriving from Venezuela in the middle of last season. Gil had 10 points against Memorial, 11 against Ferris and seven against North Bergen, all Union City victories. Junior Veronica Corado is a solid spot-up shooter who can hit the 3-pointer. Natalie Rosales is yet another freshman in the rotation at forward. Fernanda Young is a 5-foot-11 forward who wants to be able to be a major threat from the perimeter. So does the entire Soaring Eagles roster. That’s the great thing about freshmen. They eventually become sophomores. After some trying times, it appears as if the Lady Eagles are well on their way. Jim Hague can be reached via e-mail at OGSMAR@aol.com. You can also read Jim’s blog (find out how Jim became a Rams fan many years ago) at www.jimhaguesports.blogspot.com and follow Jim on Twitter @ogsmar.